Line strainer with coffee filter or 2 sheets paper towel; place over bowl. Place yogurt in strainer; refrigerate at least 2 hours or up to 24 hours to drain. In medium bowl, combine strawberries, raspberries, and blueberries. Add extract and 2 teaspoons sugar substitute; toss lightly. Chill at least 30 minutes or up to 2 hours. Transfer drained yogurt to small bowl, stir in remaining 1 tablespoon sugar substitute. Spoon 1/3 cup berry mixture into each of 2 wine or parfait glasses. Spoon half of yogurt mixture over berries. Repeat layering with half of remaining berries, remaining yogurt, and remaining berries. Top with almonds. *Note: This recipe was tested using sucralose-based sugar substitute. 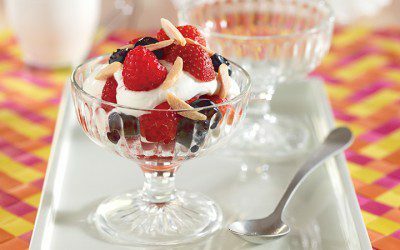 Serving size: 1/2 cup yogurt, 1 cup berries. Exchanges per serving: 1 Fat, 1 1/2 Fruit, 1 Milk.